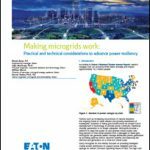 How Can Cybersecure Microgrids Help During Cyberattacks on the Grid? Michael Kilpatrick, vice president of power systems solutions for S&C Electric, explains why we need cybersecure microgrids. Kilpatrick spoke with Elisa Wood, Microgrid Knowledge chief editor, at Microgrid 2017 in Boston. We have good reason to worry about a cyberattack on the electric grid; the threat is not “overblown,” Kilpatrick said during a video interview. Attacks already have occurred on the Ukrainian grid. “U.S. utilities are constantly working on their defenses against cyber security attacks,” said Kilpatrick. A cyberattack could cause widespread power outages because of the potential for cascading failures on the interconnected electric grid. Such an attack could prove far more disastrous than a hurricane. Storms tend to be geographically specific. Utilities and energy providers are warned and can prepare. “With cybersecurity, you don’t know when it is coming, and you don’t know how big it is going to be,” Kilpatrick said. Just two days without power on a major grid could mean billions of dollars lost, he said. So how can cybersecure microgrids help? 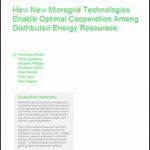 And how do cybersecure microgrids differ from conventional microgrids? It all comes down to the microgrid’s controller. As a result, cybersecure microgrids have multiple layers of defense – not just one big brain that can get hacked, Kilpatrick said. The military was an early adopter of cybersecure microgrids, installing them over five years through the Smart Power Infrastructure Demonstration for Energy Reliability and Security (SPIDERS) project. Michael Kilpatrick is vice president of power systems solutions for S&C Electric.